The Wayback Machine can give us a glimpse into the world wide web of the past, and there you can see snapshots of Middlebury’s early web sites as far back as 1997 with some data on web traffic as far back as 1995. If you go to the Web Application Development group’s web site, you will see a slide-show of how our main site has changed visually over the years. In those days, most of the content was delivered using html pages, content that stood alone on a single file, maybe pulling in some images or linking to a clever cgi script that powered a guestbook. 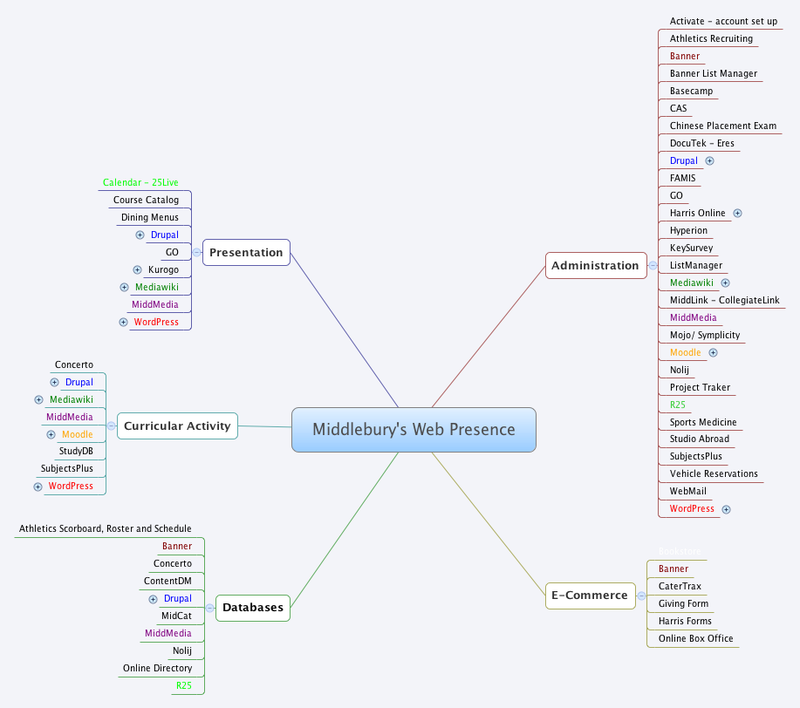 Over the last seventeen years Middlebury College has seen this grow from many linked pages to many linked platforms, sharing information across many sites and systems, making up our web presence. This picture is a high-level snapshot of the make up of our web applications at this time. The diagram uses categories to group web applications based on a common purpose or activity. Presentation – the goal is to get information to as broad an audience as possible. Curricular Activity – tied directly to teaching and learning activities, may be associated with a grade. Database – primary purpose is to organize collections of content using metatdata and some type of search functionality, may be displayed in a different way using Presentation or Curricular applications. E-commerce – a financial transaction is taking place, security and accuracy are important. Administration – tied to transfer of data and information workflow. Some of the applications land in multiple categories, these are colored for easy finding. Some support multiple sites (+), and examples have been added to give us a broader picture of the use of these applications. More sites will be added as we drill down into each category in future posts. The diagrams are meant to be information and visuals to help people understand what applications we have available and what they do, and help us make decisions on the growth of our web presence and how we support it. Note that these diagrams do not list applications installed in personal spaces on community and middfiles. If you feel that an application is missing, please email me and let me know. Comments and thoughts are also welcome. This entry was posted in LIS Staff Interest, Middlebury Community Interest, Post for MiddPoints and tagged Web Application Development on February 22, 2012 by Joseph Antonioli.